Home Costs > How Much Does Sealcoating a Driveway Cost? How Much Does Sealcoating a Driveway Cost? Sealcoating a driveway is the process of applying a sealant to an asphalt driveway as a way to maintain it. It is recommended that you get your driveway sealcoated every one to two years. Asphalt can crack and crumble over time, especially if it is not level, and most of the deterioration of a driveway is caused by water. If there is an area in the driveway that holds water, or if water somehow seeps underneath the driveway, cracks can appear. In extreme cases, the asphalt can even crumble altogether. Sealcoating can help protect your driveway from this type of water damage. Sealcoating is usually done in the summer months, but it can be done as early as May or as late as October. Most sealcoating companies are small and privately-owned, so there are generally many companies to choose from in each area. This allows you to shop around until you find a company you like. Some things to consider when checking prices are the type of sealcoat, how the sealcoat is applied, how many cracks there are in the driveway, the square footage, and if any repairs are needed. Sealcoat that is sprayed on will usually cost $0.04 – $0.05 per square foot, depending on the company. While this is the cheapest option, the sealcoat does not last as long because water must be added to the sealer in order for it to spray through a nozzle without getting clogged. Sealcoat that is brushed on will usually cost anywhere from $0.07 – $0.10 per square foot, depending on the condition of the driveway, and it will last one to two years. 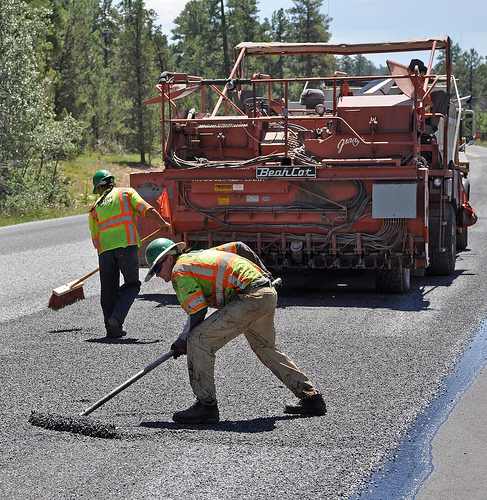 Asphalt that has never been sealcoated or has not been done in many years will absorb much more sealer and will, therefore, cost a little more. Driveways with more cracks than average will coast a little more as well. Driveways that have few cracks and have been well-maintained over the years will be the cheapest ones to get done. A water-based sealer will cost about $0.15 to $0.20 per square foot. Companies that use hot rubber crack filler rather than liquid crack filler will generally be slightly more expensive since hot rubber crack filler is much better quality. Since there are so many scenarios, consider getting multiple quotes for free from local reputable contractors at HomeAdvisor.com. According to WilliesPaving.com, the average driveway should cost around $200. Parkinglotstripingbusiness.com notes most jobs will be between $0.12 to $0.20 per square foot. The website notes the following factors affect the price: the local market, how clean the driveway is, the amount of sealcoat needed, and the size of the lot. This usually applies to parking lot jobs since the entire parking lot can’t be done in a day. For residential owners, a driveway is usually done in one day and shouldn’t have to be done in phases. How dirty is the area? Are there oil spots? The area has to be 100 percent clean so the sealcoat can apply to the surface properly. Is this a typical driveway layout or are there curves, islands or chopped areas? Most residential driveways won’t have a complex setup and most of this applies to parking lots. This is the largest factor that affects the price. The larger the driveway is, the more it’s going to cost since a contractor will charge based on the square footage. How many coats need to be applied to the site? The more coats that are needed, the higher the costs. The two common methods include spraying the sealcoat on or using a squeegee. Spraying it on will be cheaper than using a squeegee. The sealcoating company should first use a weed wacker along the edge of the driveway to remove any overhanging grass. The driveway will then be cleaned using a machine brush to remove any dirt or debris. Cracks, if present, are generally filled with either liquid or hot rubber before the sealcoat is applied. If there are any grease spills on the driveway, that area may not hold the seal. There may be special chemicals that can be applied to try to get rid of the spill. The company should use a smaller application brush around sidewalks, brick pavers, etc. to prevent the sealcoat from getting into areas that it doesn’t belong. The driveway should be taped off when finished so people are aware that it is wet and cannot be driven on for 24 hours. The company will usually put up a sign showing that the driveway is wet; this sign will also act as a form of advertising for the company. Most companies allow for a certain amount of crack filler (usually around 50 linear feet). If a driveway has more cracks than the allotted amount it will cost about $.20 per linear foot for hot rubber or about $.10 per linear foot for liquid. If a driveway is excessively dirty, perhaps from overhanging trees or being off a dirt road, the cleaning of the driveway can cost $10-$50 more, depending on its size. If a driveway is lined with brick pavers or has some sort of design with brick pavers, companies will usually charge $20-$50 extra since it will take them so much longer to do the detail around them. Traveling outside of the company’s zone can lead to additional travel expenses. Having the driveway cleaned and weed whacked before the company comes can sometimes shave some money off your price. Many companies offer a discount for repeat customers, so finding a company you like and sticking with them can save money. Sealcoating can also be done yourself for about half the price; however, this is a lot of work, can be very messy, and usually does not turn out quite as nicely. If you have just had a new driveway put it, it is recommended that you wait a year before it is sealcoated. Once it is a year old, you should get it sealcoated two years in a row to create a good seal. After this, you should get it sealcoated every two years. Most companies do free estimates, so you can simply call around and get a few different companies to give you an estimate and choose the one you feel most comfortable with. Many companies will give a discount to return customers. Find a company that you like and stick with it. I looked into pricing ALOT! Your pricing appears to be for LARGE parking lot sizes. I saw pricing for small jobs all the way up $.50 per ft-sq. That included substancial over growth removal and crack filling. The more Sq feet the cheaper per Ft-sq. I typically saw $.10 – $.16 for just sealing a residential Drive way. You could easily double that if you needed edging and crack cleaning-sealed.